DANS LES TEMPS ANCIENS, LES GENS ETAIENT FASCINES PAR LE FEU. LE FEU A UN POUVOIR MYSTERIEUX POUR REUNIR LES GENS. LE CARRE CENTRAL EST UN ENDROIT QUI RELIE LES GENS ET L'ALLEE. LE MUR MIROITANT D'ORDURES EN FEU EST UN SYMBOLE DE L'ALLEE COMME UNE USINE DE RETRAITEMENT DES DECHETS. ALORS LE ROLE DU FEU ANCIEN EST RESSUSCITE DANS UNE ALLEE URBAINE. LES ORDURES VEHICULENT DES IMAGES NEGATIVES COMME LE BRICK-A-BRAC OU LA SALETE. NEANMOINS, LES CHOSES NE DEVIENNENT ORDURES QUE PARCE QU'ON LES CONSIDERE COMME DESAFFECTEES. ELLES NE SONT PAS APPELEES ORDURES SI ELLES SONT RECYCLEES OU REUTILISEES PAR QUELQU'UN. IL S'AGIT D'UN PROJET DE CARRE SERVANT A RECOLTER LES ORDURES DANS UNE ALLEE DE TOKYO. LA, TOUTE SORTE D'ORDURES SONT TRANSFORMEES EN OBJETS NOUVEAUX ET UTILES. CELA SIGNIFIE QU'IL N'Y A PAS D'ORDURES DANS CETTE ALLEE. LES GENS APPORTENT DIFFERENTS OBJETS DESAFFECTES AU CARRE ET REPARTENT AVEC QUELQUE CHOSE D'INTERESSANT D'UNE MANIERE OU D'UNE AUTRE. LES GENS UTILISENT LE CARRE POUR ECHANGER LEURS POSSESSIONS. IN ANCIENT TIMES, PEOPLE WERE FASCINATED BY FIRE. FIRE HAS SUCH A MYSTERIOUS POWER TO GATHER PEOPLE. THE CENTER SQUARE IS A PLACE TO RELATE PEOPLE AND　THE ALLEY. THE GLITTERING WALL OF BURNING GARBAGE IS A SYMBOL OF THE ALLEY AS A RECLAIM FACTORY OF GARBAGE. NOW THE ANCIENT FIRE IS REKINDLED HERE IN AN URBAN ALLEY. GARBAGE CONVEYS NEGATIVE IMAGES SUCH AS JUNK AND　DIRT. HOWEVER, THINGS BECOME GARBAGE ONLY BECAUSE WE CONSIDER THEM AS　DISUSED. THEY ARE NOT TO BE CALLED GARBAGE FOR SOMEONE IF THEY RECYCLE OR REUSE THEM. 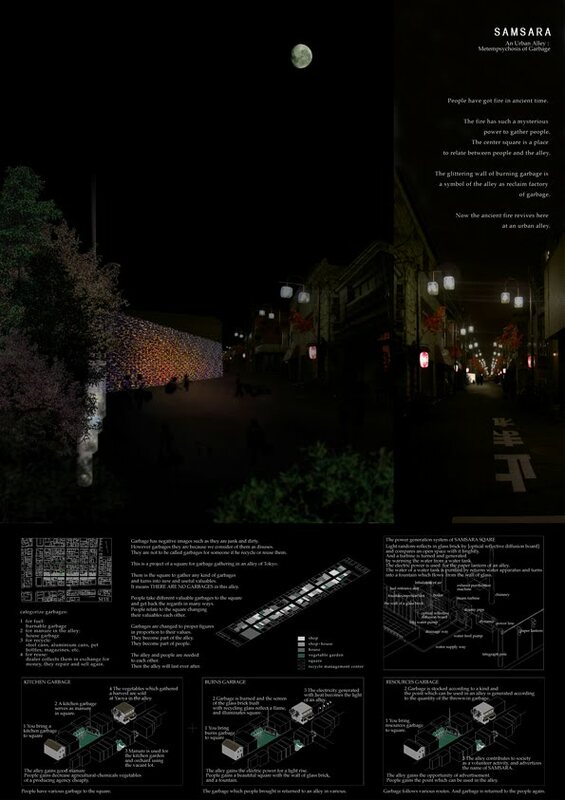 THIS IS A PROJECT OF A SQUARE FOR GATHERING GARBAGE IN AN　ALLEY OF TOKYO. THERE, ANY KIND OF GARBAGE IS TURNED INTO NEW AND USEFUL VALUABLES. IT MEANS THERE IS NO GARBAGE IN THIS ALLEY. PEOPLE BRING DIFFERENT DISUSED THINGS TO THE SQUARE AND GET BACK SOMETHING OF INTEREST IN ONE WAY OR ANOTHER. PEOPLE USE THE SQUARE TO EXCHANGE THEIR VALUABLES WITH EACH　OTHER.